Adaptive 4-stage charge characteristic: bulk – absorption – float – storage. Two full rated outputs and one 4 Amp output. Universal input 90-265V, 50/60Hz. The Phoenix charger features a microprocessor controlled adaptive battery management system that can be preset to suit different types of batteries. The adaptive feature will automatically optimise the charge process relative to the way the battery is being used. Use the options in the dropdown menus below to select the DC Voltage and the Charging Amps required. Click on the “ADDITIONAL INFORMATION” tab below to see the available options for this product. The Phoenix charger features a microprocessor controlled adaptive battery management system that can be preset to suit different types of batteries. The adaptive feature will automatically optimise the process relative to the way the battery is being used. When only shallow discharges occur the absorption time is kept short in order to prevent overcharging of the battery. After a deep discharge the absorption time is automatically increased to make sure that the battery is completely recharged. 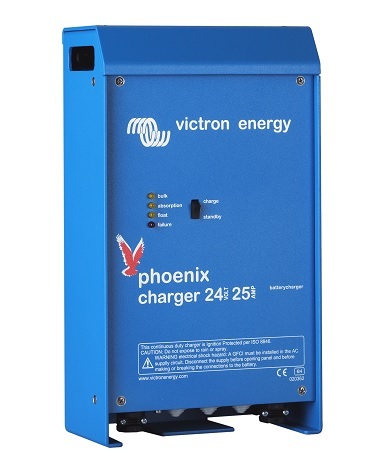 If, in order to quickly charge a battery, a high charge current in combination with a high absorption voltage has been chosen, the Phoenix charger will prevent damage due to excessive gassing by automatically limiting the rate of voltage increase once the gassing voltage has been reached.